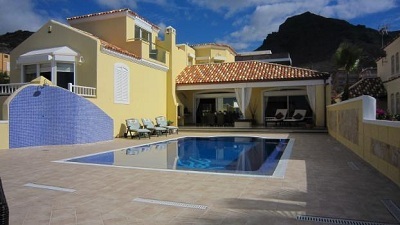 Villa Caledonia is a luxurious 4 bedroom villa, situated in the quiet residential area of El Madronal in the Fanabe area of Tenerife. The villa is well situated as the Gran Sur shopping centre is close by, which is home to a large supermarket, clothes shops, restaurants and a cinema. Additionally there are restaurants and a taxi rank in walking distance and Fanabe beach and even more restaurants are just a 5 minute drive away. The outside area consists of a private heated pool with outside shower, sun terrace with sun loungers, a covered terrace with more sun loungers and a patio table and chairs. There are 2 double bedrooms with super-king size beds and 2 twin rooms. The double bedrooms both have ensuite bathrooms and there is a separate family bathroom. The living room has a large luxurious sofa and a 42 inch flat screen TV with satellite channels, a Bose sound system and even an iphone docking station. There is also a games room with a pool table, table tennis and darts. This house is rented for short periods under Article 3 of Law 29/1994 Urban Leasing - "LAU". A temporary rental to third parties agreement will be signed on guests arrival at the villa. A copy of guests passports will also be required.